IMPORTANT: It has just been reported to me that the email through my CONTACT page has not been working for the last few days. If you have sent Richard or me a message recently, the chances are we haven’t recieved it, so please send again or contact Richard direct on richardebull@gmail.com. Sorry about this. Thanks. Helen. Just found this book review by Andrea Baines of the Holistic Network in Ireland. Check out her website and blog, you might find it interesting. Helen Parry-Jones is a gifted Spiritual Medium and Healer. “Hands of an Angel” is Helen’s own story of how, with the help of her spirit guide Sam, she developed her natural ability to not only see the spirit world and learn to understand the mechanics of mediumship, but also her discovery of how she could “see into” people’s bodies, discover what ails them and provide the healing they need. Helen comes across as a very unassuming, down-to-earth and compassionate human being, whose extraordinary abilities have enabled her to heal many people over the course of her life so far. She explains how healing comes in many forms; from relaying spirit messages from loved ones who have passed over, to channelling loving energy through her hands to others. Despite having some unquestionable spiritual experiences as a small child and teenager, Helen tells of her great frustrations and difficulties in being so different from her friends and family, and her struggle to make her parent’s believe in her experiences. Though her faith is tested many times, it is through sheer perseverance, dedication to spirit and compassion for people and animals that Helen continued to follow her intuitions not to ignore her abilities, despite the lack of support of those closest to her. As you follow Helen’s story you will discover some very valuable teachings that Helen received from her guide, Sam; about how we live our lives, about love and forgiveness, why we suffer pain, and the opposing forces of other dimensions. What is also very moving in this book is that Helen gave space to relay Sam’s heartbreaking account of his own life and death. Helen is from England, but regularly visits Ireland, having secured a Sunday evening slot on Dublin’s Sunshine FM. “Hands of an Angel” is a wonderfully inspiring and enjoyable story. Galway here I come again!! Very excited and getting ready to return to Galway later in May for a seminar at the Radison Hotel. 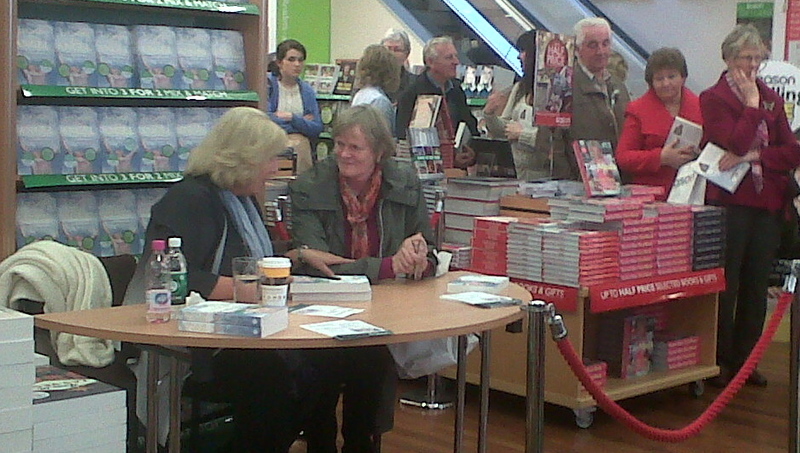 I had a great response last time and I met over 200 lovely people at my booksigning at Easons wanting to wish me well and have thier book signed. Flicking through old photos and found this one of my great “Sunshine” team, Denzil and Karren. Miss you both and our Sunday night messages! !